Eating fish has long been applauded as being healthy - but now there is real evidence that fish is good for the heart. In fact, the omega-3 fatty acids found in many types of fish are not only good at keeping healthy people healthy, but also beneficial in helping reduce heart attack and mortality in those who already have the condition. Studies that go back as far as 30 years are now proving that regularly eating oily fish or taking a dietary supplement of fish oil can reduce the incidence of cardiovascular related deaths in people with heart disease by as much as one-third. Fatty acids are considered the "good" kind of fat that our bodies need to stay healthy. They help oxygen move through our bloodstream to reach the parts of the body it needs to reach, and they also help build cell membranes, strong organs and tissue. Long-chain fatty acids found in certain types of oily fish contain two key elements that are good for heart health. They are DHA (docosahexaenoic acid) and EPA (eicosapentaenoic acid). They are able to permeate the cells of the heart, and help improve it in a variety of ways. The body does not produce fatty acids on its own, which is why we can benefit from eating foods and taking supplements containing them. Dieticians familiar with heart disease recommend that healthy adults take 500 mg of fish oil containing these fatty acids daily, while those with heart disease take up to 1,000 mg.
As always, check with your GP before taking dietary supplements of any kind, even those that are completely natural, as they can interact with each other and with prescribed medication. These vegetable oils and nuts are considered to be high in alpha-linolenic acid as well, which is another origin of essential fatty acids which we need, but which our bodies do not produce. Taking fish oil may have other benefits has well. Some studies point to the fact that it might improve brain power in children, and recent research shows that it might be helpful in reducing incidence of periodontitis, or gum disease, as it reduces inflammation in the gums. Fatty acids are recommended for people with Crohn's disease as well, as they help reduce inflammation of the intestines. 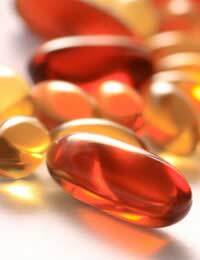 Studies have also shown that fish oil helps relieve symptoms of active rheumatoid arthritis. When consuming oily fish, it is best to advise eating not just one type of fish only, to avoid ingesting an excess of contaminants from pollution (such as is found in salmon, for example). So be varied with your menus, and go wild with different recipes that contain the essential fish oils we need. Also, be aware that some fish oils, such as cod liver oil, contain a high amount of vitamin A, which in excess can be dangerous to children as it can hinder the growth of developing bones. Yet another reason why it's important to consult with a doctor before taking supplements of any kind.